One man had a vision, a vision that even he didn’t realise would become so popular, a story and universe not yet told in the history of cinema. George Lucas, a young an optimistic film maker, best friends with Steven Spielberg, became one of the pioneers of cinema when he made and released Star Wars in 1977. The film had such a massive success that it flourished into a full trilogy; making two huge sequels over the following six years, easily commencing the modern idea of “The Blockbuster”. Not only did Star Wars win six Academy Awards, it was one of the very first films to gain its own merchandise, and boy has that legacy never ended! For almost fifteen years George Lucas reaped the benefits of his money-spinning franchise. Endless toy lines, some of the very first video computer games (and continuing into every new generation) spin-off television movies, children’s cartoons, cinema re-releases and a film-quality enhancement in the mid-nineties, removing special effect composition outlines and scratches. For fifteen years it was like Lucas was always present in the industry…. yet the man did not direct a single movie since Star Wars in 1977. Boom, from nowhere seemingly, Lucas announces three new Star Wars movies at the end of the millennium. Three prequel movies to expand the history of the classic trilogy everyone knew and loved, and even then the concept of the prequel was relatively new, once again making Star Wars a forerunner in cinema history. Everyone. Everyone and their dog, could not contain the excitement. What can I say about the humble beginnings of a franchise that defined several generations and changed the face of popular cinema? 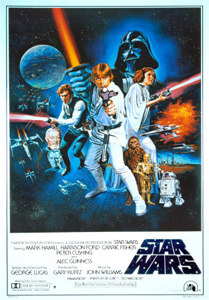 Star Wars follows the story of Luke Skywalker, a simple “farm boy” who finds himself carried off on an adventure to rescue a princess from an evil Empire. He is aided by his mentor, Obi Wan Kenobi, the reckless smuggler Han Solo, and two droids. I deliberately got myself a copy of the original version, in cinemas in 1977 and you know, 45 years on, it is still epic. Even the special effects and model shots are still impressive, mostly due to clever, sweeping camera work, and upon watching it you cannot deny the fact that this film blew audiences away. Director George Lucas was a pioneer of film in the 1970s, and Star Wars (not titled A New Hope back then) was laughed at by studios, and Lucas gained total control over the project and all rights to the franchise. This was due to the time in which the film was made; studios believed only in bleak, real and hard dramas, audiences only wanted thrillers such as Taxi Driver, Godfather and The French Connection. A film that promoted fun and excitement was unheard of. But that is the result of Star Wars, singularly, one film changed the face of Hollywood forever and that isn’t an exaggeration. The characters are stereotypes, but the dialogue is charming and instantly memorable and likeable. The story is incredibly straight forward, but there is a magic and theatre about the universe, a strange yet familiar vibe; many details aren’t expanded upon, yet you are given enough to accept them. One could argue that there really isn’t any groundwork for a franchise, mostly because Lucas never intended, nor believed, for it to become anything more. It is a standalone experience; quite slowly paced at first, but ramps up to eleven for an exhausting finale that shakes your nerves. I love this film. The sequel to the film that defines blockbusters, defines the sequels to blockbusters, and Empire is easily the best Star Wars film ever made. Darth Vader, having survived the destruction of the Death Star, hunts down the remaining Rebel forces while pursuing Luke Skywalker, who is quickly learning the ancient ways of the Force. As the Empire’s grip tightens, Luke finds the lives of his friends in mortal danger. At just under two hours, it is stunning how much happens in this film; we see frozen ice worlds, swamps, massive space cruisers and cloud cities. The once simple characters from the first film are fleshed out and very vulnerable now, yet their wit and charm has never been stronger. Harrison Ford as Han Solo appears to be in his stride and steals every scene he is in; certainly the rogue element that makes the original trilogy so great. All of our performances are excellent, and of course, the true reveal of Darth Vader is also one of cinema’s greatest achievements. In a pre-Internet age, film could do that; deliver a shocking and surprising turn to devastate not only the characters but the audience too. The film boasts some of John Williams’ best musical work, from intense barrages of action to the very best science fiction romance, the asteroid belt sequence? My god, I get shivers just from thinking about the music! I honestly, honestly cannot fault this movie. 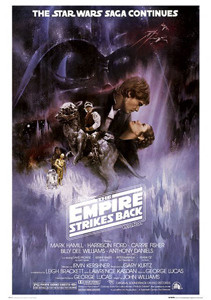 Star Wars had a simplicity to it, Return of the Jedi has tonal problems, but Empire Strikes Back is a sequel in the truest form. What better sequel could the grandfather of blockbusters ask for? It is dark and full of foreboding, yet contains some of the very best space opera action set pieces ever. Return of the Jedi must be one of the most technically challenging Star Wars films ever made; including the most frenetic space battles and complex puppeteering for the time. It may not as consistent as Empire, but it still has one of the greatest finales in sci-fi history. Our heroes move to rescue Han Solo from the gangster Jabba the Hutt on Tatooine, while the Empire constructs a new terrible Death Star battle station. Luke, having mastered the power of The Force, must face his destiny and attempt to restore his father’s name. I love Jedi more than some, simply because of the epic space battle in its conclusion, and how it is juxtaposed with the lightsaber duel between Darth Vader and Luke (I don’t care what anyone says, it is the best duel in the saga) with the emotional weight upon the characters compelling them to battle. Destiny and the repeating of dark history are the keystones of Jedi’s story. In the pre-Internet age, audiences must have been absolutely clawing their way into theatres after the cliffhanger of Empire Strikes Back, three long years before. The conclusion of the trilogy is a suitably involved experience and we see our characters have grown over their experiences. Especially Luke Skywalker, who has come far from the farm boy in the original. I will say though that audiences are divided over the Ewoks and their role in the film. It certainly makes for a lighter tone than with Empire, and infinitely multiplies Star Wars’ marketability, while being a little questionable; a powerful Empire brought to its knees by teddy bears with sticks? However like I said, I love the battles that run parallel to this, so I was never that bothered. A satisfying end; the characters face their destinies and both the light-heartedness and darker tones are both fulfilled. The concept of prequels to these three grand films was unfathomable. Everyone knew we would see the creation of Darth Vader, one of the most iconic super villains of cinema history, as well as the terrible history that so marred the trilogy’s past. 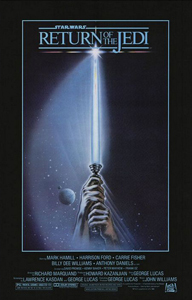 The extinction of the Jedi, the Clone Wars, everything described was dark and muddied by tragedy, so much so that it seeped into Luke’s own destiny. What wonders and epic visions will we experience upon learning how it all came to pass? Awful CGI Jabba the Hutt has my sympathies, I was falling asleep. There is a reason why there are so many videos documenting what’s wrong with Episode One, and I might not be capable of summing it all up. This film is a disaster. 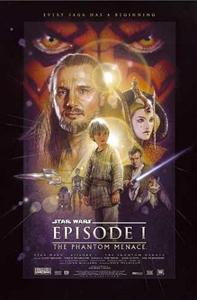 A Trade Federation has taxation rights on the peaceful planet of Naboo, and two Jedi are sent to settle the growing anxieties only to find a boy with powerful links to the Force. Yadda-yadda-yadda. They also find obnoxious CGI abominations at every turn; the film’s special effects are already aging twelve years on (the original trilogy lasted at least twice that amount of time) and composite layering looks nasty, and the Gun-Guns especially look transparent in their non-existence. The editing is choppy and the dialogue is half hearted with the original trilogy’s charm being replaced with an assortment of lead balloons. No involvement or passion. The film feels rushed, especially as you might consider they had two decades to prepare it! There are brief, BRIEF moments of clarity (such as Anakin leaving his mother behind on Tatooine) and no, Darth Maul isn’t enough to save it. For every miniscule good moment, there’s an agonisingly long pod race, or Jar Jar being a total prat. I cannot list all of the logic flaws in Episode One… but I can point out some. Star Wars is known to be theatrics over substance, but these are too glaringly obvious to let pass! Why did Anakin make a “Protocol” droid for his mother who works as a slave? Why didn’t the Jedi use the breathing apparatus they had at the lake when subjected to toxins on the Federation space station? Why doesn’t Obi Wan use the Jedi “sprint” power (as previously displayed) to help Qui-Gon in the fight against Darth Maul? Why would the Federation put their main reactor in the cargo bay next to all the volatile explosives, ammunitions and space craft? Why do people even bother talking to Jar Jar? A separatist movement unsettles the Republic, and the senate has to decide on forming an Army of the Republic. Meanwhile, Anakin Skywalker is angsty. It is hard to believe but… this one was worse than I remember, and I think it was whenever this film aped Empire Strikes Back… or tried to. George Lucas clearly has no idea how to direct actors, at all, and every romantic scene with Padme and Anakin fall utterly flat, or into some obscure creepy scene with Hayden Christiansen sneering. There is an awful, awful barrage of romance scenes that play out like Lucas’ test runs while reading “Directing Romance 101 For Dummies”. Despite having virtually removed Jar Jar (and sadly replacing him with a torturously misused C-3PO) and the Gun-Guns, the final act’s battle sequences are hideous and drab, despite how exciting they appear to be. Oh they are better than Phantom Menace’s attempts, but only just. There are some decent scenes though, unlike PM. 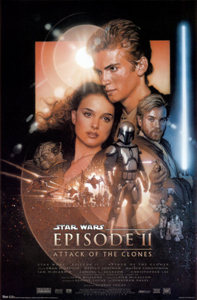 Anakin’s vengeful return to Tatooine to save his mother, and the fight between Obi Wan and Jango Fett in the rain. However… the first example here is plagued by infuriating editing/transition choices that make the audience unsure of what they are looking at, and as for the second example…. WHY IS BOBA FETT A KID IN THIS!? Seriously, did Lucas really think the best way to honour/bring back the [second] coolest character in his franchise was to make him a little kid?? The entire final act upon the planet Geonosis is a travesty, a gabled mess of CGI foolery, while the romance that is supposed to herald the birth of much loved characters is passionless. A few choice scenes are remarkable… but little else. And so it ends, the prequels begin the transition towards the old and familiar with more gusto, but still suffers from colossal time wasting and from being the most marketable SW film yet. Chancellor Palpatine is close to full control over the Republic, but the other systems refuse control until a rogue droid commander known as General Grievous is destroyed. 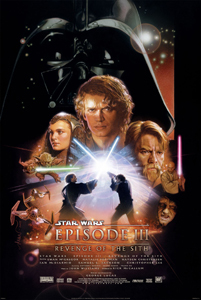 Anakin Skywalker and Obi Wan are on the case, but during this time, Anakin finds himself caught a battle of morality between the Jedi and the Sith. Star Wars legendarily started toy markets with films, and arguing against this might make people call me a hypocrite, but really, Episode Three has so much irrelevant gadgets, machines, battles, vehicles etc, all for the sake of “Oh-oh, your child will want this toy!” Why does Obi Wan ride a giant lizard-thing?? Where did it come from?? How can he summon it with a whistle?? Is it like a park-and-ride, are they all summoned by a human whistle? So I can’t say I cared for the battle sequences, they are overlong and overloaded again, but the humour was better; the first few scenes had some good dialogue. One killer issue is audiences asking: “Who is General Grievous? ?” Good question. I hope you watched the Clone Wars children’s cartoon! So it is far, far away from the original trilogy’s integrity, with persistent battles with children’s toys, but the conclusion is quite exciting. Now you might think that is the end of the review… but you’d be wrong! Star Wars is a persistent beast, and as I have described already there where many things directed specifically towards children. 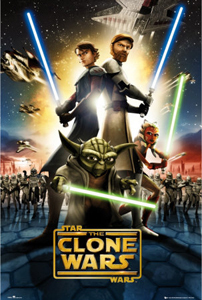 I did not watch The Clone Wars cartoon, although I heard it was quite good for what it was, set between Episodes Two and Three, seeing Obi Wan and Anakin fighting together against the Separatists and the Sith. While back in the 1980s there was the Droids and Ewoks cartoons, following R2-D2, C-3PO and… well, Ewoks, respectively. But I am reviewing for you now three movies aimed at the kiddie market, both old and new! It is one for the kiddies, but even then it appears to do little in inspiring confidence to those uninitiated to the cartoon show. My first reaction to this cartoon was; “Huh, the CGI isn’t much different from the full motion pictures”, excluding the obviously caricature humans and leading characters. There was little difference in drive and story, only this time there doesn’t appear to be anything of relevance happening at all! Why are we even focused on Jabba’s son? Why did Jabba have to be in this at all? It ultimately felt like unnecessary filler, nothing of consequence happens. But then, it wasn’t as god awful as people have said… it is NOT great… but it is surprising to hear loyal SW fans being in such uproar about it when you can compare it to Episodes One and Two. As a television cartoon feature, it isn’t bad, if you paid for cinema admission though… ho-ho, you were robbed. Additional Marshmallows: Samuel L. Jackson, Christopher Lee and Antoney Daniels return as their characters, other roles are filled by their cartoon voice actors. 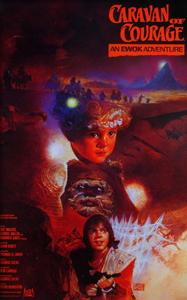 The Caravan of Courage – An Ewok Adventure (1984)It is said that Lucasfilm didn’t have the budget to include Wookies in The Return of the Jedi, but it is also said Ewoks replaced them for being more marketable towards children. The creation of two Ewok Adventure television movies would suggest the latter! Released a year after Jedi, Caravan of Courage follows a family whose ship crash lands on Endor, and the son and daughter find themselves lost after their parents are kidnapped by a mountain dwelling giant. It is up to the native Ewoks to form a team (read: caravan) to help the children rescue their parents. 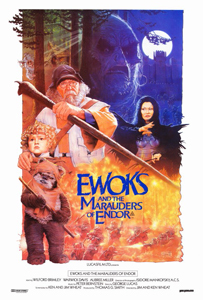 This film is very peculiar… For a start, the Ewoks don’t speak English (or Galactic Basic for all you SW fans) so how does the film counteract this? With a narrator! Otherwise the children mostly cry for help, moan or complain at the Ewoks as they travel. Their journey has some strange encounters, excluding the monstrous Gorax, such as glowing pixies and lakes that teleport anyone underwater when they touch the surface. Weird. The young girl, Cindel, is positively awful, and while the boy Mace isn’t much better, his bouts of emotion sometimes trump Hayden Christiansen or Jake Lloyd! It is a slow film, especially in getting started and the narration hinders it too, but for a film made entirely for kids (and specifically kids who saw Return of the Jedi) it is harmless enough. (aka Ewoks: The Battle for Endor) (1985)A follow-up television movie, off the back of Caravan of Courage, is much darker and exciting. Cindel finds herself alone after alien marauders attack the Ewok village in search for “The Power” from her parent’s crashed spacecraft. It is up to Wicket, Cindel and some new friends to defeat this menace of Endor. I’ve watched a lot of Star Wars now, and perhaps I am going mad, but this movie (aka Battle for Endor) wasn’t actually half bad. I was fearful as the story centred around Cindel and her awful acting does not improve, but there is so much more happening here than with Caravan of Courage. The marauders attack in force with huge monsters and lasers, while the heroes discover another crashed spacecraft (this must happen a lot on Endor). Wicket now speaks a little English (so the narration is gone thankfully) and the new character of Noa, an old man marooned on Endor, is quite endearing and has some snarky dialogue to quip. My only problem with it is the gigantic castle these marauders live in… Endor is a forest moon right? Do these guys actually live on Endor, if so how big is Endor anyway?? So yeah, I actually quite liked this, as a short Star Wars children’s film, it is dark but with fun characters and doesn’t slow down too much. As a sequel to Caravan it makes that film feel more worthwhile too. Additional Marshmallows: Battle for Endor / Marauders later inspired the cartoon series called Ewoks. One of the reasons I wanted to do this Saga was George Lucas’ recent hissy-fit towards critics and the fan base, announcing to the world that he has had enough of making Blockbuster films as all he receives is criticism. There is an argument that Lucas deserves better, that he is one of the pioneers of cinema still. No. I’m sorry but in 1977 he was a pioneer, since then he has had his credibility in question from all sides. I’m almost certain that those critics he bemoans were the individuals who praised and respected his vision forty years ago, if only he’d realise that he has completely lost his way. The prequels are shameful, narratively and in production value, and have evidently not withstood the test of time like the original trilogy. I always feel sad when I look at how the saga has evolved… and how hard it is to maintain the magic and theatre of the originals without remembering Lucas’ apparent vision of how events transpired.